A beautiful post on Eric Kim’s Street Photography site, 10 Things Anders Petersen Can Teach You About Street Photography in which Kim explores the thoughts and pictures of Petersen. I’m not sure that you can teach most street photographers anything- its a genre that seems to attract and encourage the unthinking, and one which I think is generally long past its sell-by date – but most of it is great advice for most photographers. Not necessarily what you should do, because you need to find ways of working that suit you, and there are many who his won’t fit, but there are things which we can all learn from even if we decide on a different path. My thanks to Peggy Sue Amison, artistic director of the Sirius Arts Centre in East Cork, a place I often wish I lived closer to, and whose Facebook posts often light up my mornings, as this one did, for sharing this. and something that disappoints me about much recent street photography is that it seems to be more about clever design exercises than working from the heart. Another that struck a real chord with me is Kim’s number 8, ‘Focus on content, not form‘, but it is really an article you need to read and digest for yourself. And when you have done so, like me you will probably want to go on to read more by Kim, and in particular his 10 Things Garry Winogrand Can Teach You About Street Photography. For most work now I need a more flexible approach, but the idea of reducing thought about anything technical to a minimum still holds. Almost every exposure I make is with the camera on ‘P’ (photographers joke it stands for Professional), although I often use of the thumb wheel to modify the shutter/aperture combination when I can see a need for a faster shutter speed or greater depth of field, as well as usually having some exposure compensation – my default is to give an extra 1/3 stop. Thanks perhaps to some curious thinking by Nikon, P doesn’t give sensible results with flash at night, unless you like your subject with a black background. Usually I switch to A so I can choose the aperture or S if I want to use slow shutter speeds. Working fast with longer focal lengths is really only possible with good autofocus, and modern camera viewfinders are generally pretty poor for manual focus. Although I often know I don’t need to focus when I’m working wide-angle, most of the time I leave it on, as otherwise I forget to turn it back on when I really need it. I didn’t know Martine Franck, and although I have occasionally seen and admired her photographs, had never really formed any clear views about her and her work. So when she died on 16 August, aged 74, I didn’t feel I had anything to say about her, though I did read the obituary in The Guardian and look at her work on Magnum. Today Le Journal de la Photographie (in English) devotes itself to a collection of short tributes about her written by nine people who did know her, and it makes interesting reading, as well as three comments by Franck on her own images, which include probably the only one that most people in photography would instantly know as by her, a man in a hammock watching women at a pool in Le Brusc, Provence in 1976. I hadn’t realised before that she was Belgian – born in Antwerp – and had an English mother. And while on the subject of places, I can tell Magnum that Newcastle upon Tyne is how they should spell it, and that it isn’t in Yorkshire! But I do like the photograph Franck took there, along with many others by her on the Magnum pages. There really is probably little reason why most of you reading this should have much interest in my Auntie Mabel, though she was one of my favourite aunts. But I think these pictures have a wider appeal than simply being about a particular person. 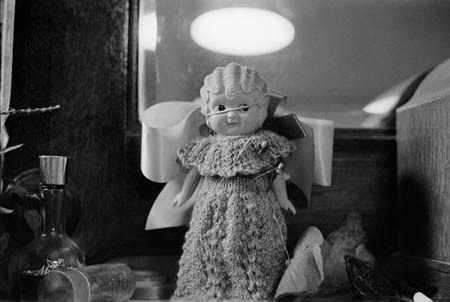 They were made in 1977 a few weeks before her 85th birthday, using available light and Tri-X or HP4 film, probably pushed a stop or two. Mabel Marshall was born (as I’m often reminded) on the day that the last train in England ran on the broad gauge lines out of Paddington. The train pulled into Swindon on Friday 20 May 1892 and immediately the engineers got to work on replacing the track with standard gauge, completing the job over the weekend. Meanwhile elsewhere, my grandmother was giving birth. She may well have been aware of the changes taking place to our rail system, as she herself had travelled down those wider lines some years earlier from Wales, where much of her family still lived. And even when I was small, they still used to send a bird – usually a goose – down ready for the table at Christmas, to be collected by one of my uncles from Paddington station. Mabel had four sisters and two brothers, all younger than her. The girls were all of the age whose possible husbands were men killed in the First World War, creating a great shortage of men, and only one of her sisters ever married. Mabel, seven and a half when my father was born, as the eldest of the children will have taken much of the responsibility for looking after him and the other young ones, but she never had children of her own – almost 40 when she was married, she was probably by that time too old. She and my father actually got married within a year or two, not of course to each other, but their partners were also brother and sister, she becoming a Tabor while my own mother, a dozen years younger than Mabel became a Marshall. Her husband had taught the classes at the Richmond and Twickenham Bee-Keeping Association when my father went to learn bee-keeping (later my father was to look after the assopciation’s hives and teach others there.) The two men got on well and introduced each other to their sisters and that I suppose is where my story really starts, though it was perhaps 20 years before I came into it. 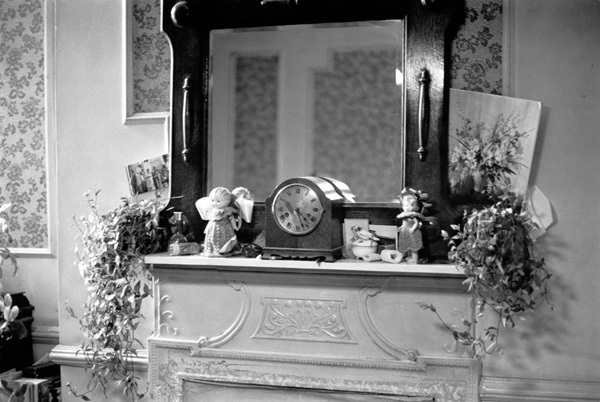 Mabel and Alf were married around 1931, and moved into a rather gloomy late Victorian semi-detached in Sunnycroft Road, a large house for two, but it was often rather crowded on the family occasions when we visited. 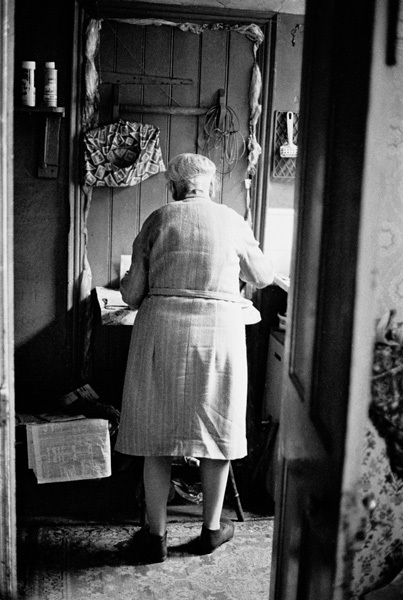 Around 45 years later when I took these pictures, Mabel had been a widow for some years, living there alone. Even when I was a child in the 1950s it had seemed an old-fashioned house, still lit by gas, when most of the rest of us had long moved to electric. 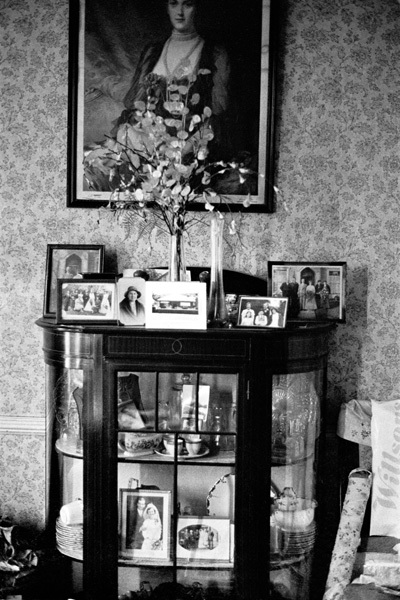 Little if anything had changed by 1977 except that there were now rather more photographs on the stand in the rarely used front room, which include one of my own wedding pictures (fortunately largely hidden) as well as one of my own first son who was with us on our visit. 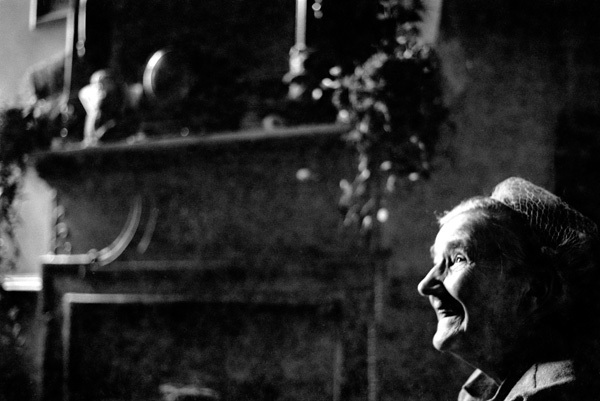 I knew as I took the pictures that this was probably the last time we would visit the house; life on her own was becoming difficult and before long Mabel would be moving out into sheltered accommodation. 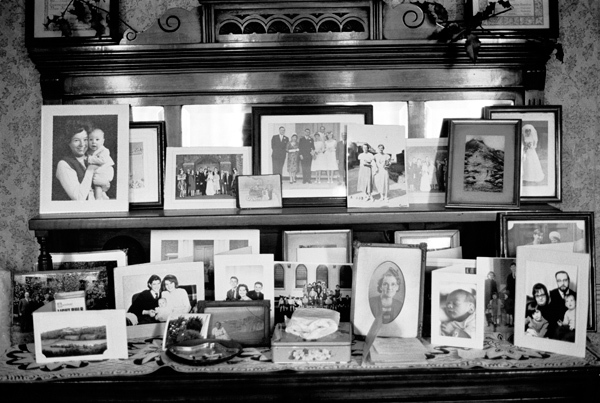 The next time we visited she was living in a single room, still with some of the same photographs on display, but otherwise very different (and about 15 degrees Celsius warmer.) I gave her one or two of the pictures, but I think by then her sight had almost gone. 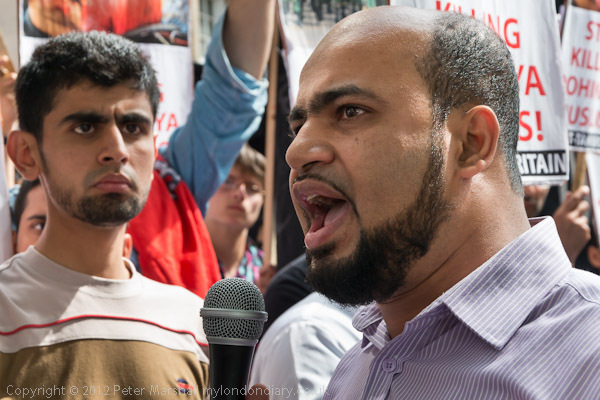 It was back in 2004 that I first came across Hizb ut-Tahrir Britain, which I described then as “an independent Islamic political party dedicated to re-establishing the Islamic way of life under an Islamic caliphate (Khilifah.) The repetition of the word ‘Islamic’ was of course deliberate and intended to mirror the relentess and repetitive approach of the speeches and the visual effect, with its large banners, black characters on intense orange. There were very few journalists and photographers at that event, and I remember talking to one of them, a man who had been researching and following the movement for some time and who considered it to be a dangerous and influential fundamentalist movement which governments would be wise to proscribe. There have I think been a few minor changes over the past 8 years, at least presentationally, although the protests still look much the same, but I think the speakers are a little less strident (though I only understand those who speak in English) and some have been careful to point out that they are not aiming at the overthrow and replacement of the British state and that their ambition is for the Khilfah to replace the current corrupt and largely dictatorial rulers of the Muslim states. 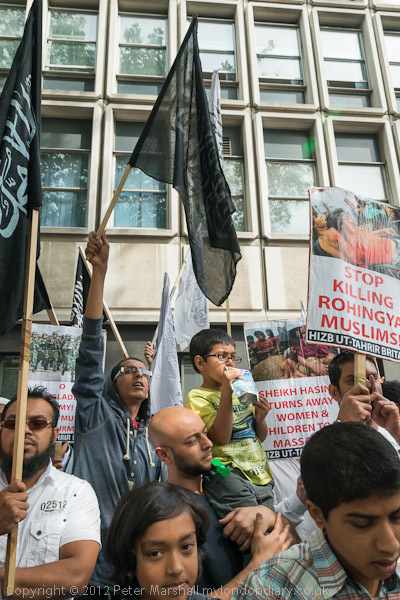 Although their removal seems an excellent idea, I’m certainly not convinced that I would want to live under the rule of Hizb ut-Tahrir, and I still find some aspects of their protests unsettling. One is the separation between men and women at their protests; it isn’t the actual segregation I find so disturbing but that women seem often to be treated as second-class citizens, off to one side of where the real action (in this case the speeches and the loudspeakers relaying them) was taking place, with none of the speakers being women. Many of them were so far away along the road that they could not see or even hear properly what was going on. 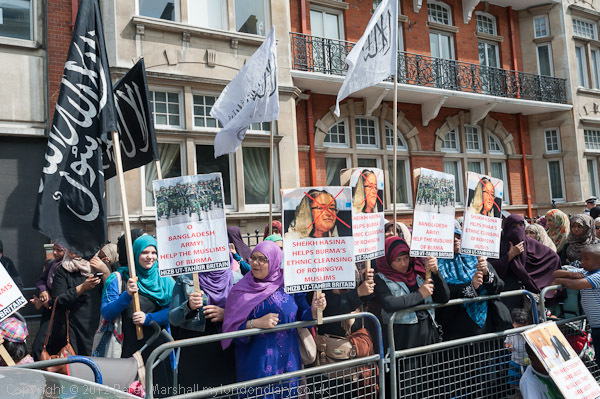 The only time I’ve seen the women of Hizb ut-Tahir ever fully taking part in a protest was at a ‘women only’ protest over the French ban on Islamic face veils. I like to get to events on time, if not at least a few minutes early. Often the most interesting situations happen as people are arriving and things are being set up, though I also generally stay on as long as I can. Years ago, when I first went to photograph a number of carnivals with a few friends, I was surprised that as soon as the actual procession started they would put their cameras away and go to the pub, but usually they were right, many events are essentially over for the photographer once they have started. Others – and perhaps this protest was one – never really begin. 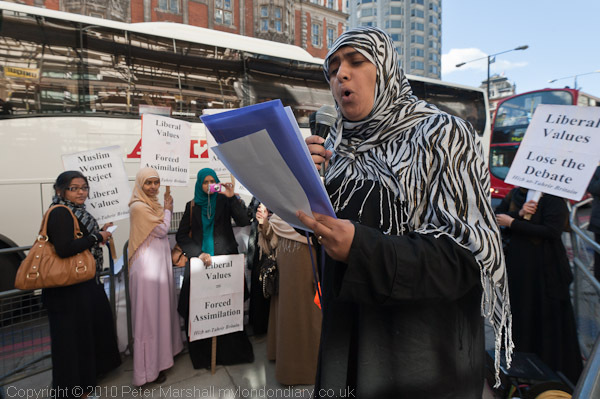 My lateness was simply a result of London traffic and my decision to take a bus to the protest. Buses are my favourite method of travel around London, giving a great view of the city from the upper deck, but like cars and taxis they are unreliable. On this occasion I’d had far too long to enjoy the view of Fulham Broadway on my way to Kensington. The only really reliable way to get around London is on a bike, or for shorter distances, feet. But I don’t like taking my bike to protests, as finding a good place to use my heavyweight lock can be difficult, and even the best locks only deter the more casual thieves and don’t protect against vandalism. They are also a nuisance with marches, when you have to go back to the start to collect them. But had I thought, I would have ridden to this static protest in a posh area on a sunny day when traffic was likely to be bad, especially with various large sporting events in the city. But I’m getting old and lazy and have a free bus pass I like to use! The still photograph can’t convey the actual words that people say, but it can show something of the mood and I concentrate on the expressions and gestures of the protesters and in particular the speakers. 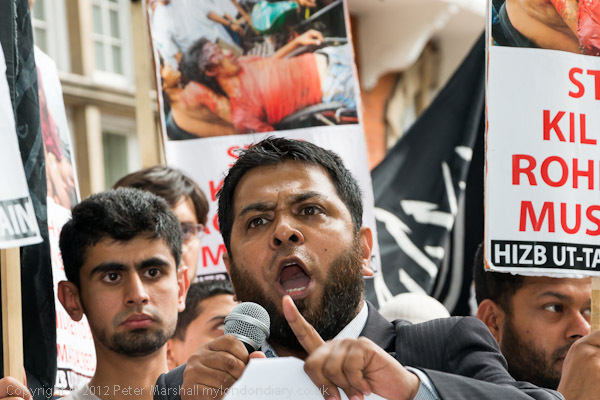 Words and images may come from placards and banners, which are also very important in photographing protests. Photographers are very attracted by sounds at protests, whether those of people chanting, shouting or speaking or (absent from this event) music or drumming etc. If you are working with video, the sounds are often the most important part of the event, but as a still photographer you need to keep reminding yourself that they don’t record in your images. You have to work to try and catch the feeling of the moment. It’s a start to be seeing and hearing the excitement – it suggests you are somewhere near the right place – but you have to work hard to make it show in your images. Of course it’s important to be honest about the event you are photographing, while obviously your photographs will also present your own point of view. I’m often unhappy about the way that single images are used in the press which often give a very distorted view of events, and I’m far happier presenting my own work through sites like Demotix or My London Dairy where I can tell a story in some depth, both in pictures and text. 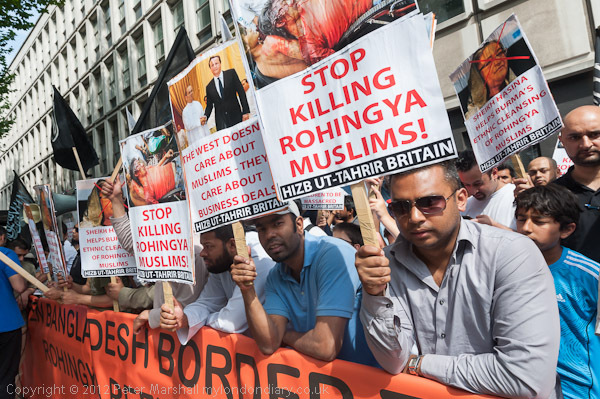 Although I often share the concerns of Hizb ut-Tahrir which they express in protests – as in this case over the terrible oppression of the Rohingya people in Burma, caught up in the long-running dispute between Burma and neighbouring Bangladesh, with its origins going back into the British rule of India (more on this – and more pictures – in Hizb ut-Tahrir Supports Rohingya on My London Diary), like that journalist I talked to I find the movement disturbing. It seems to represents an extremism which I find chilling, just as I do that of the extremist Christian and political groups I’ve photographed. But unlike many extremist groups, Hizb ut-Tahrir welcome media attention and are always attentive (sometimes perhaps a little too attentive) to journalists and photographers. I don’t think they should be banned but I do wish that more mainstream and moderate Muslim organisations were more vocal both about them and the wider issues that they address. One of the bonuses of walking around London as I do quite often is that you often come across places and events you were unaware of, or at least that let you see them in a different way. In September 2004, I’d gone to Hyde Park Crescent to take pictures of ‘Horsemen’s Sunday‘, an event I’d read about but never seen, and where most of the men apart from the vicar turned out to be women or children. I was staggered to find that the Hyde Park Pony Club had so many members, but it was an event that once seen I’ve not felt the need to revisit – and I think Thelwell would have done it more justice. I find horses tricky to photograph and I think they look at their best from a distance, like bicycles they don’t respond too well to my usual ultra-wide approach, though the 12-24mm Sigma I was using then on an DX camera was rather less extreme than either the 10.5mm DX semi fisheye or the 16-35mm FX I now prefer. London when my father was a boy a hundred years ago was still a largely horse-powered city – and he helped his father making horse-drawn carts, later graduating after a period working in munitions and a trip to France patching up biplanes for the Royal Flying Corps (and on to Germany in the RAF to fraternize with the Fräuleins returned to find the internal combustion engine had taken over and for a while he built wooden fire engines and charabancs. London’s pollution became rather less obvious (the horses mainly moved out to the Home Counties as expensive toys for the wealthier commuters and their families) and needed much less shovelling but rather than being good for the roses and veg now poisoned us, first mainly with lead, but now with nitrogen oxides and respirable suspended particles. I’m always a little worried by the abbreviation PM, as in PM10 or PM2.5, because those letters are my initials. Of course the also stand for Prime Minister, and I could certainly do a better job than the present incumbent, though I’ve no wish to volunteer. But, back to real life, as I wandered away from the wealthy horse riders of London, I came across another event taking place a short distance away, a group of people standing around a piece of sculpture that had not been there the last time I’d wandered down Great Cumberland Place perhaps ten years earlier, and I stopped to investigate and take a few pictures, and a couple of them ended up in My London Diary too. But this year I went to the same place on purpose, and did I think a little better with the pictures of the Raoul Wallenberg 100th Anniversary. 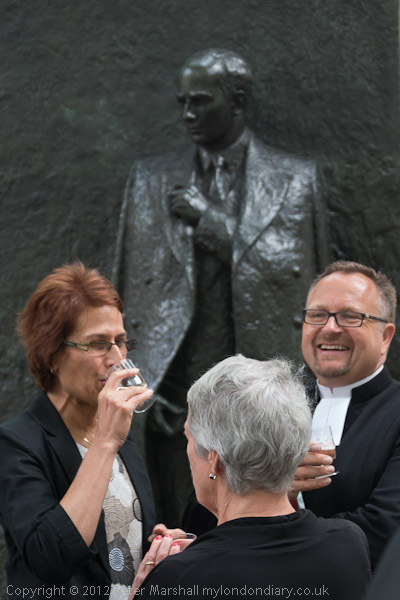 After the ceremony I was pleased to drink a toast to a great man too. It was commemorating one of the great heroes of the twentieth century, a man who put his own life at risk by going to Budapest as a Swedish diplomat during the Nazi occupation to issue the Jewish population there with false ‘protective passports’ which identified them as Swedish subjects awaiting repatriation saved probably 100,000 from the death camps. (Surprisingly he survived the Nazis only to be imprisoned and killed by the Russians – and a new inquiry into the date and manner of his death was announced by Sweden recently.) 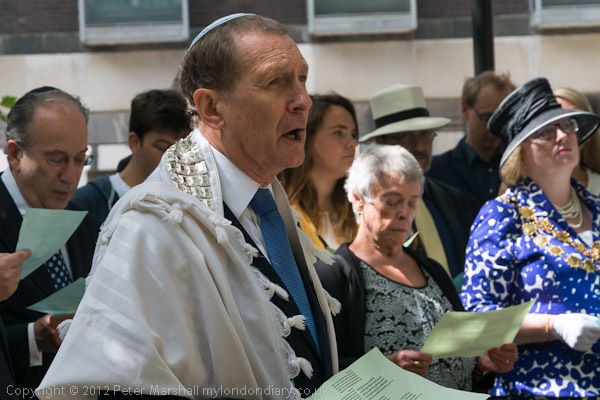 The anniversary wasn’t entirely unnoticed in the media, with similar events taking place elsewhere around the world, but I think I was the only professional photographer and journalist present at the London event. It’s been a while since I’ve bumped into Brian David Stevens on the streets of London, and now I know why. He has been hiding in a tunnel under Waterloo station, and you can see the results in a fine set of images on his web site, Graffiti. I have to admit that my heart sank when I saw that title, with everyone in the world now uploading even the merest lick of paint on a wall onto Flickr in their millions, but as I expected, his work is very different. And yes, I have occasionally photographed the odd Banksy or even rather better work on the wall, but I seldom inflict many of them on others. And one aspect of the Olympic sanitisation I found most disturbing was the fairly wholesale remove of the graffiti that have some areas of London much of their character. Even more disturbing is the council’s vandalism on the Heygate estate at the Elephant, where they came and painted over the Heygate Community Garden paintings and murals. They appear to have “singled out for painting over the large and thoughtful pieces around the Community Gardens and pond” while leaving the pointless tags, nonsense and occasionally obscene scrawls on buildings over the rest of the estate. 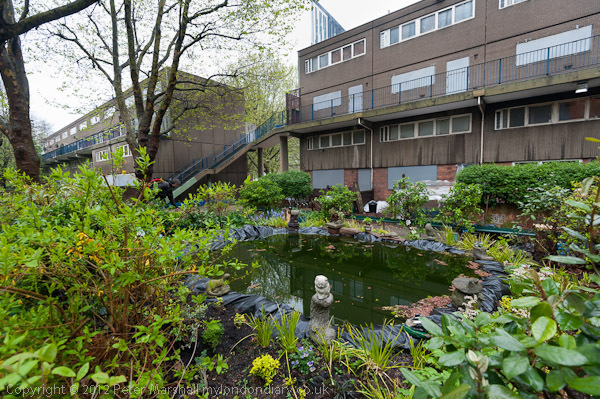 You can see some of my pictures and more of the story about the Heygate estate – and next on the Council’s hit list the nearby and larger Aylesbury estate in Heygate Estate Scandal, Heygate Panoramas and Walking the Rip-Off – Heygate & Aylesbury. Back to Brian David Stevens, don’t miss the other fine work on his site – I particularly like his stark black and white in Doggerland. 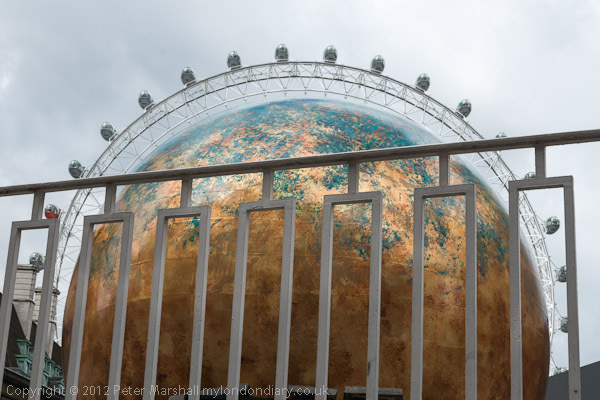 A few weeks ago I saw the large sphere in this image being installed on the pavement by the Shell Centre in York Road and immediately thought of a picture rather like this, but there was too much clutter around it at the time. But a week or so ago, as I was rushing to catch a train home from Waterloo, I took a few seconds to take it. In my haste, I didn’t quite get it right, though it looked pretty accurate in the viewfinder. It was actually very difficult to find exactly the right position, and even slight movements of the camera got the two arcs out of alignment. It’s one of the very few pictures I’ve taken this year where a tripod would possibly have helped, although I’m not sure I could have got one in the right place. It isn’t a great picture, but I thought just a little different view of the London Eye, and one that perhaps amused me more for the intellectual property issues more than as an image. The London Eye is a protected design and although this doesn’t stop you from photographing it, places restrictions on the uses to which images can be put. Fortunately editorial use – such as the above is not affected.You can also freely use images which contain the Eye but are not actually pictures of it, for example the view of the Thames downstream from Westminster Bridge where it is only a part of a wider panorama. However because the design is intrinsic to the picture above, this might be a difficult picture to argue that point. So on that the image is probably in the clear. One important exception is that this generally does not apply to 2D works. So all those photographs you and I have taken with graffiti, murals, advertising hoardings, posters and so on in them could be in breach of copyright, though you only need to worry about such things if you are thinking of supplying them for commercial use (generally meaning for use in adverts, packaging etc.) For editorial usage – and that includes fine art (and pretty coarse art like this site) – there are few things you need to worry about. I’ve long been a fan of Walker Evans, and in particular his 1938 book ‘American Photographs’ and there is a well-thumbed copy of the 50th anniversary edition published by the Museum of Modern Art (who published the first edition) in 1988. That edition “with new duotone plates from the original prints” aimed to recreate the design and typography of the original “as precisely as possible”, and was I think rather an improvement on the original in terms of the quality of the printed images. 25 years on, we have the “75th anniversary edition of American Photographs, reissued by the Museum of Modern Art in an edition that recaptures, for the first time since its original release, what might be called the books radical purity.” I’m not sure that it differs in this respect from the edition I have . The original was printed in 5000 copies, with an elegant cloth binding (Evans called it ‘Bible cloth’) and with various small touches that are no longer possibly in a reasonably priced edition. Printing technology has of course changed completely from the 1930s letterpress, also used for the second and rather different edition of 1962. You can read more about the book and see 18 of the 87 images from the book (the MoMA show the original accompanied had 100 pictures) in a piece on the TIME LightBox by Ben Cosgrove. Many of the best-known images by Evans were taken when he was working for the FSA, and you can see them on the Library of Congress web site, including the two albums of prints made when working with James Agee on another book, Let Us Now Praise Famous Men. Many of his images on the LoC site now seem to be very poorly scanned from ‘intermediary roll film’ reproductions, but there are still over 40 decent high res scans available from the original negatives, so you can try making your own prints of his images. I breathed a sigh of relief late on Sunday evening as the closing ceremony for the London 2012 Olympics lumbered to its end. Not of course that I was watching or even listening to it – Radio 3 has one of its rare jazz programmes late on Sunday nights – but the posts had been rolling into Facebook, mainly rather negative comments about the various groups involved. But perhaps now we can have our city back. Though of course we now have the Paralympics to look forward to, with disabled protesters promising to play a better game than their able-bodied counterparts. If I’d lived in the east of London, I might even have ventured out for the fireworks, perhaps finding a good viewpoint, but it was all happening too late for me to easily make my way home. Unlike many I’d not got caught up by the ‘Olympic Spirit’, and had hardly seen more than the odd second or two (not having a TV in the house helps) though I’d been pleased to hear some of the stories of success of some of the athletes, even if the repeated playing of commentators shouting hoarsely about British successes soon got rather wearing. But I was genuinely pleased to see British cyclists doing well (even if I still think the Keirin is a ridiculous event) though rather more pleased over their success earlier in the Tour de France, after which the Olympics seemed slightly small beer. But there are certainly some events I can’t take seriously as sport (like synchronised swimming and the one somebody described our medal winner as being rewarded for ‘looking slightly royal on a horse’) and others such as boxing I’d like to see banned. But there are other aspects of the Olympics – not the sport – that worried me. Seeing British police strolling through crowds carrying sub-machine guns still makes me feel I’m in the wrong country, and the truly unnecessary ‘security’ – like the closing of the canal towpath for a couple of months. 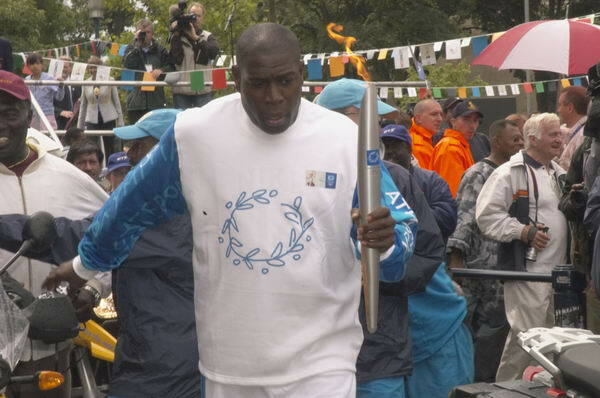 I photographed the Olympic torch relay through Brixton in 2004, where Frank Bruno and Davina McCall were running with it through the streets. Everyone with them was local and was having a good time. Security was virtually non-existent and certainly unobtrusive, as was the corporate presence – Samsung were there and handing out corporate flags and other stuff to the kids, but that was about it. 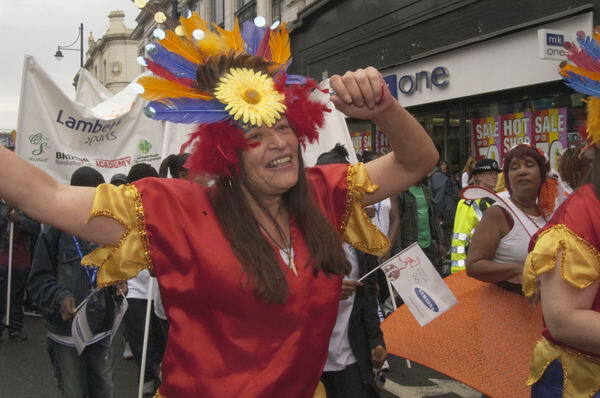 Various local music and carnival groups followed the torch along the High Street and it was bright and colourful and fun for those taking part and watching. This year it seemed to have a very different atmosphere, and where I saw it local participation seemed limited to standing on the pavement at the side of the road as corporate floats rolled past in front of the torch bearer who was flanked with what looked like a dozen or so plain clothes police. So many stories seem to be about the control of people by corporate interests and the branding police. Long established businesses with Greek connections trading for years under the name ‘Olympic’ being forced to change their names, butchers, bakers and florists being told to remove window displays using the 5 rings, and so many more. I was also saddened by the removal of much of the graffiti that characterised some of the areas surrounding the site, and by some of the stories I heard about rough sleepers and others being ‘tidied up’ in central London. Various arrests of people, often who had not actually committed an offence, so that the police could impose bail conditions which included staying out of the Olympic boroughs during the games and after. Probably most of them will find any charges against them dropped – because there never really was a case. It will be interesting to see exactly how many of the 182 cyclists arrested on the night of the opening ceremony actually end up in court. Wide-ranging restrictions were imposed on freedom of association in the area around the Olympics, and in particular against the local youth. But there were some good aspects apart from the sport. G4S showed that it isn’t a good idea to rely on companies like them to provide services – and the military who came to take their place seemed to have done the job far better than they would have done. (And their uniforms cost considerably less than the average of £6,250 per uniform the government had negotiated with G4S – a figure which shows just how using private companies like this saves money!) The Olympics did at least give an opportunity for the spotlight to be turned on the activities – away from the games – of some of the sponsors, and I’ve previously written about some of the actions against Dow, BP and others. Although the restrictions in place prevented much actually happening in Stratford. 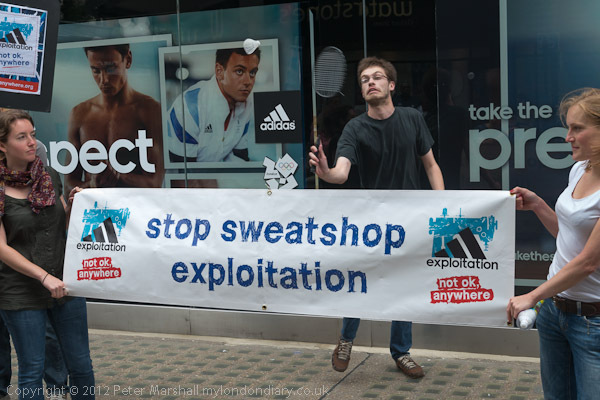 On Saturday 4 August, War on Want took advantage of the games to highlight the corporate malpractices of the official sportswear partner of London 2012, Adidas, holding their own games in a protest outside the company’s main Oxford St store. The hurdles race was perhaps the most spectacular, highlighting the allegations that some workers producing Adidas clothing in China are forced to work 90 hour weeks, and that workers in Indonesia and Sri Lanka are paid poverty wages – some as low as 34p an hour – and many are told they will be sacked if they complain or try to join a union. A PR company working for Adidas came to talk to me and sent me their statement denying this, but this seemed only to relate to their workers in Bangladesh and War on Want’s evidence came from reliable sources. Badminton was another sport involved in the protest, having got some bad publicity earlier in the week when some of the players deliberately played to lose – and when both sides were doing so it became obvious. War on Want’s playing perhaps reflected this, although the women did rather better than the men. More about the protest and more pictures in Adidas Stop Your Olympic Exploitation on My London Diary. Or to give it the full title Hipsters stunned as vintage cameras fail to make them professional photographers on Hayibo made me laugh a little, because it contains some rather astute observations on several things that annoy me. Like the guys who routinely convert their colour digital images of protests before posting them on the web, presumably because they think that this somehow make them more authentically ‘documentary’. Or even those who think that using film somehow makes them better photographers. On one digital printing forum the other day there was a guy who posted (or rather boasted) about how he was going to take all his pictures on film and set up a wet darkroom to print them onto photographic paper because that would somehow make them real photographs rather than the digital crap the rest of us make. I’ve nothing against black and white. 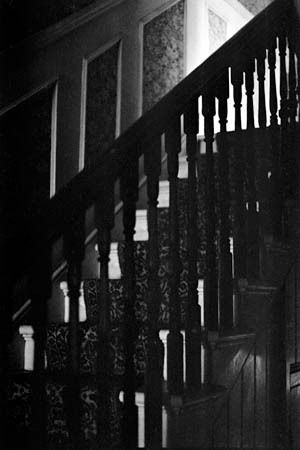 I spent years mainly taking black and white images, using Tri-X, FP4 and the rest. Got good enough at printing to be asked by other photographers on various occasions if I would print their stuff. Took loads of colour film too. If you want to work in black and white – and just occasionally I think there are good reasons to do so – you need to learn to think in black and white. Not enough to own a camera that will convert your images to black and white or even a great Photoshop plugin which will do it even better. There are photographers who do it well, and some of them will be rich enough to afford Leica’s M Monochrom digital camera. (Of course their M8 (I made the mistake of buying one) is actually a decent monochrome digital, just had problems with colour. But the M Monochrom looks great for those who want to work in black and white and have around £6,000 to spare. I’d love one. There really was nothing special about film. I’m currently spending several hours a day scanning it and cursing it for its many faults. Too many frames that have bits of fogging from loading in bright light, or where I tried to squeeze in another exposure on the end of the roll. Scratches from dirty cameras or cassettes or careless handling by darkroom technicians (myself included.) Some have even suffered damage from abrasion while inside ‘archival’ storage sheets. Dust, dust, dust, both embedded during the drying or picked up later and held by powerful static electrical forces. Not to mention those that have had coffee, beer, wine, spit and various other liquids spattered across them in later life. Most of my negatives were at least properly washed, unlike some trade processed material, though I’m told that a small residue of chemicals can actually help to preserve them. Perhaps they also would help protect them from the insects who have made some of my files their homes over the years, who I’m sure like their gelatin additive-free. Of course I exaggerate – if only slightly. But for working in black and white, digital has many advantages, and for working in colour, one over-riding one. Colour is simply so much better. Film gave you colours from the manufacturer’s tin rather than the real world. Of course colour differs between different camera manufacturers and can be altered in processing, but the overall colour quality from both the Nikon and Fuji cameras I use is superb. There are still a few tricky areas, for example in the handling of bright oranges and reds. For some of the Guantanamo protests where those taking place wear bright orange jump suits I sometimes find I need to change to a different camera profile, but for normal subjects everything works fine. And as for the printing, a good scan with the Minolta Dimage Scan Multi Pro (fitted with a diffuser) gives a better result than my Apo-Rodagon or other expensive enlarging lenses, and printing with the Epson R2400 allows me to work in Photoshop with a subtlety that was simply unattainable in the darkroom. It’s a bonus that the prints are likely to last longer too. You are currently browsing the Re-photo blog archives for August, 2012.